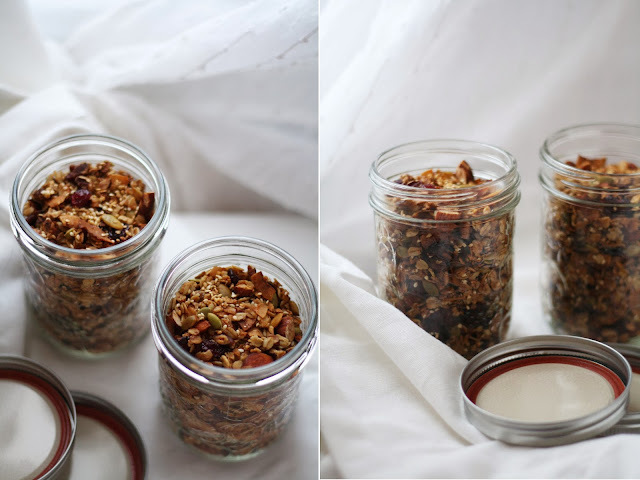 I came across Marge Granola through Sprouted Kitchen's holiday gift guide. It then led me to this site, which may have just become my new favourite website. Quitokeeto describes themselves as an "online purveyor of items worth owning", and I couldn't agree more. Definitely worth a look if you ask me. I was fascinated with the praise Marge Granola was getting, and managed to find a rough breakdown of the proportions at The Kitchn. I used the description on the packaging for a little extra guidance. I may have to agree with The Faux Martha, this just might be the last granola recipe I turn to for a while. Yum! In a separate bowl, whisk together the oil, maple syrup and vanilla. Pour the liquid over the oats and mix well to combine. Spread the mixture onto two parchment lined baking sheets - ensure the granola is spread in a single layer. Bake for 20-30 minutes, stirring every 10 minutes. 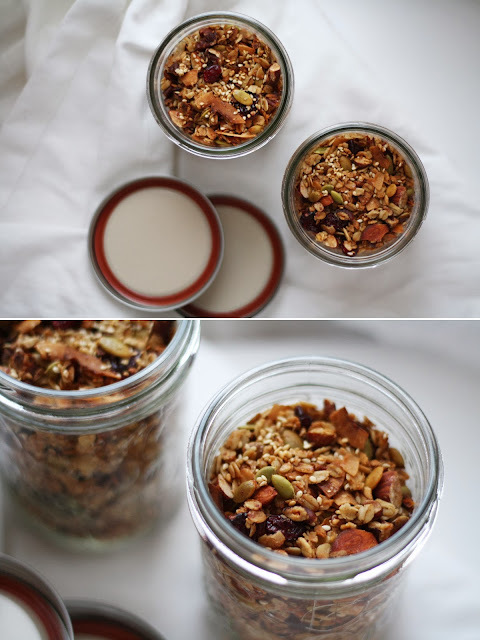 Monitor the granola regularly to avoid burning. Oats will crisp up once removed from the oven. Add the cranberries to the hot mixture and let cool before storing. I decided to make a few extra batches and wrap these bad boys up as some last minute Christmas gifts. I headed to the local Home Hardware, bought some mason jars, burlap and holiday ribbon. After letting the granola cool, I filled each jar and wrapped it with a 8x8 inch piece of burlap. I threaded the card onto the ribbon and tied it. I made the cards with brown card stock and a sharpie. Head over here for a little inspiration. Merry Christmas!